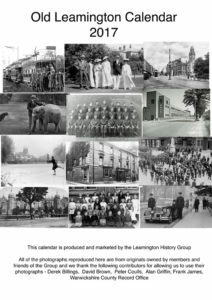 This is our Calendar for 2017 which shows scenes and memories of the town and is compiled by our members. All previous editions have sold quickly which has been very pleasing. Copies may be purchased at our meetings at South Lodge, Jephson Gardens, The Parade at 10.00 am to 12.00 pm on most Tuesday mornings OR at our monthly meetings – View Details Here.